Super Eagles striker Simeon Tochukwu Nwankwo is a target for Italian Serie A newcomers Frosinone Calcio, according to reports. Transfermarket website Tuttomercatoweb.com says Simy is one of the names being considered by the Gialloazzurri to lead their frontline in the new season. 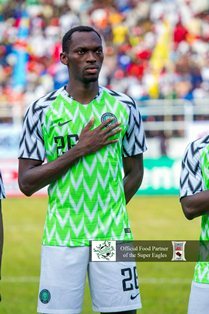 The lanky frontman is in the final twelve months of his contract with Crotone and will hurt his chances of getting an invitation to the Nigerian National Team in future, if he remains at the relegated Serie A side. Simy turned out for Portuguese clubs Gil Vicente FC and Portimonense SC before sealing a transfer to Crotone in July 2016. Interest in Simy was supposed to be high in the summer transfer window but he could not showoff at the 2018 World Cup, having lasted less than five minutes on the pitch after coming off the bench against Croatia and Argentina. As previously reported by this website, an unnamed United Arab Emirates team is interested in signing him.